Established 2014 in Statesville North Carolina, Highland Composites is the composite structures division of Highland Industries, Inc. (see their recent Django Upgrade here). Highland Composites utilizes a full range of braided, woven, and raw fibers together with proprietary, state-of-the-art technology to create composite products for use in a wide variety of structural applications. As a new player in the marketplace, Highland Composites needed to demonstrate their unique capabilities and value proposition. Composites manufacturing is a complex industry that can utilize many different technologies; Highland specializes in braided composites, composite overbraiding, and open architecture composite structures (proprietary to Highland Composites). The Highland Industries website was not attracting appropriate customers for the Highland Composites brand and did not effectively feature their Composites offerings. DesignHammer built a custom WordPress website for Highland Composites to showcase their capabilities and attract leads. 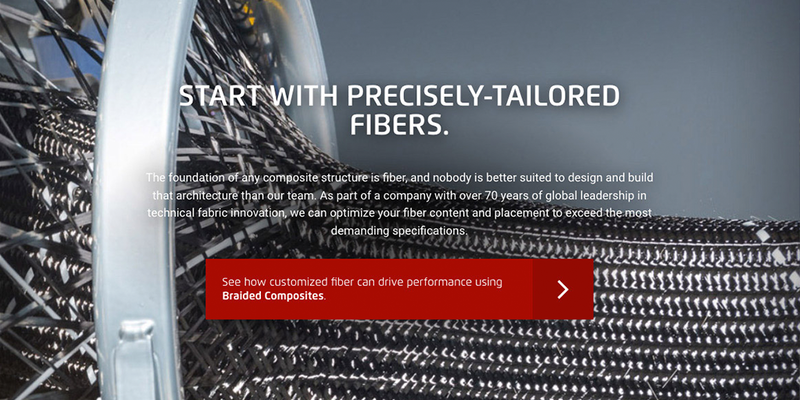 The new website featured high-resolution photography and videos to quickly educate prospects on how Highland Composites’ technologies can make parts faster, lighter, stronger, tougher or more consistent, as well as highlighting the differences between composites and conventional process. To better position themselves and appeal to their target prospects across multiple industries, the new website featured case studies with application examples tailored to the best use of Highland Composites technologies. Social sharing buttons (Facebook, Twitter, and Vimeo) were integrated into relevant content to facilitate multi-outlet media campaigns. Google Analytics was configured to track website traffic and appropriate conversions (contacts from prospects). To help the Highland Composites business development team quantify results, custom reports were also configured for specific advertising efforts. Highland Composites focuses their business development efforts on conferences, trade shows, and industry meetings. This team can now leverage the website to reinforce their capabilities with identified prospects. Highland Composites measures the success of these efforts by increased traffic and website interaction during and following targeted business development events. Following a recent trade show, Highland Composites tracked an impressive 100% increase in page views, a 50% increase in new users, and a 50% increase lead acquisition via the website. The Highland Industries website was based on Django 1.4 which was approaching end of life. To ensure that the platform stayed up to date it needed to be updated to a more recent version. Django 1.7 introduced native data migrations and the implementation of them was not compatible with the site's existing table structure. We decided to target the latest long term support release of Django: 1.8 LTS. In order to complete the migration the Django instance had to be updated, in turn, from 1.4 to 1.5, then to 1.6, then 1.7, and finally 1.8. Each version of Django represented a long list of potentially breaking changes. In addition to this, the existing Django implementation relied on mutiply-inherited data models for representing content pages in the site. We carefully undertook a process of updating Django to the next version and then reviewing and documenting deprecations. We also carefully restructured the database schema and model definitions so that they could be properly understood by Django's migrations system. We did all of this in a safe testing environment using Vagrant. Once the migration work was complete and well-tested in a development environment we were able to perform the migration on the production server. The migration went very smoothly with minimal interruption and no visible change to end users. The result is that the Highland Industries website continues to run on the latest LTS release of Django. Additional development projects for the site have benefitted from having native migrations and better dependency support. The Intelli-Pole® product line was acquired by Highland Composites and in need of a new website to go along with the updated branding material. The previous website also lacked good content and didn't represent the product to its full potential. DesignHammer created a new website using WordPress to allow for easy content entry. Additionally we created an animation to demonstrate how easy it is to set up and work with a new Intelli-Pole®, and a configuration tool that can be used to show a variety of options when it comes to pole heights. Interiors In Flight believes that its potential customers are unaware of what Interiors In Flight can bring to their project and how their services justify a premium price versus their competition. The greatest challenge is that Interiors in Flight are unable to use photos of their products displayed in the completed aircraft due to disclosure agreements with their customers. A number of competitors have such photos. A primary focus of the website is to communicate the Interiors in Flight value proposition without directly using photos of customer’s products. The new website established Interiors In Flight as the platinum standard for customized airplane seating and cabinetry. We accomplished this by appealing primarily to the emotions of VVIPs and their representatives, designers, and completion centers. The new website is a simple yet elegant design that shows the quality products only Interiors In Flight can produce. Displays detail and active emotion on every page the user visits, without the use of customer photos of newly completed aircraft. DesignHammer’s team on this project included Pausback Advertising, Exum Photography, and Patrick W. Carroll Consulting.